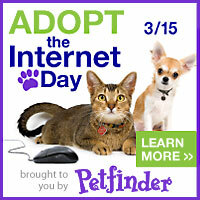 Petfinder is celebrating their 15th birthday. And to honor the work of this amazing organization, I'm highlighting two lovely felines who are deserving of forever homes. Say hello to Florida and Sweets! You can make a difference in a cat's life. Florida recently came to the Animal Haven shelter along with her three kittens when they were found outside. She is exceptionally sweet and very content and relaxed around people. She would be the perfect lap cat! Now that her babies are old enough to be without her, Florida is ready to find a home of her own where she can be the one being cuddled and cared for. Sweets is a cat that fits her name. She's a sweetie, but she's no pushover. This poor mother came to Anjellicle Cats Rescue from the euthanasia list where she and her babies were very sick and about to be put down. Sadly, her babies didn't make it, and for a while, Sweets was in grave danger. Time and attention and lots of medication helped bring her back from the brink. Since there were several orphaned babies who had also been rescued but had no mother, Sweets was able to still be a mom to some needy kittens. Sweets was a great mom and now she is spayed and healthy and ready for a home of her own. She's talkative, bright-eyed and independent. She'll greet you every day for ear scratches, and would also be okay in a home with other cats, maybe even a dog. Happy Birthday Petfinder! Thank you for giving so many animals the gift of life and happiness. We're purring for a lot of kitties to find their forever homes today. And we're participating too! Awwww those babies are just precious!!! I sooooo hope they find their furever homes! I just tweeted this and shared it on my Cat Chat Facebook page! Yay Ann! So glad you are doing this! What a lovely couple of kitties. Such sweeties! I hope those purrfect forever homes are looking at you right now! Thank you for doing such a great post! We are purring and praying that these sweethearts find their forever homes real soon. Both Florida and Sweets are so cute!! I feel so sad about Sweets' babies...but how wonderful she took care of other babies. Both deserve great homes. I hope they will find wonderful home and family very soon. I sure hope these precious girls get a forever home. Ann, thank you for visiting and leaving me the website for the coffee info. The coffee was good, but my sister wouldn't drink it...lol I'm on my last 2 bags of beans. It is named KOPI KAMPUNG, not the 'cat urine'flavored coffee. Not long ago, on 'The Doctors' show, they mentioned this 'cat' coffee and showed a picture of the cat that leaves his deposits. They also said that this coffee is $35 a cup in their coffee houses. Hi, Ann, I just read the info on the coffee and surely what I had wasn't the coffee dung coffee...lol. Mine smelled like cat pee. I wish now I had kept the packet it came in. I put milk in it as for any coffee I drink.